5 lakes with over 180 pegs! Cavendish Lake – an oblong shaped lake with pegs down just one site. Fishing a pole down the side or at 11m works well, as do waggler and feeder tactics. Maunside – a smaller straight lake with 20 pegs. With depths of up to 5ft this offers good year round pole fishing. Sherwood Lake – a large “S” shaped lake (quite apt) with a number of pegs which will leave you feeling tired after a few hours fishing. There are lots of enticing areas and features to fish to. Langdale Channel – a small oval shaped lake which is perfect for beginners or a relaxing pleasure session. Holmedale Lake – possibly the most interesting lake due to its irregular shape. This lake holds the venues match record of 232lbs. 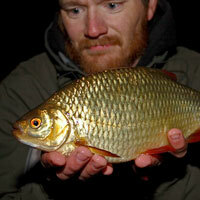 The lake contains a high number of carp, but on hard days the large head of silver fish can provide good sport. The venue often has regular matches – if you plan on fishing a specific lake you may be advised to check the lake is available to save being disappointed when you rock up with your tackle. Address: Off Forest Road, Edwinstowe, Nottinghamshire, NG21 9HL.